Last week, I had a chance to sit down with Dr. Hawk right after his presentation at the World Health Care Congress (WHCC). Dr. Hawk is the Vice-President and Division Head for Cancer Prevention and Population Sciences at the University of Texas M. D. Anderson Cancer Center. He’s been there since late 2007 when he came from the National Cancer Institute. Cancer is a process not an event. Communication is critical. The $227B total cancer cost in the US (2007). The personalization of risk assessments and interventions. The services of MD Anderson. The US Preventative Services Task Force. The work that they’re doing direct with an employer (Shell). The CEO Cancer Gold Standard. The impact of aspirin on all-cause mortality. So, after his formal presentation, we talked about several things. One of the big focus areas for MD Anderson is prevention. As we know from research, many cancers are preventable. And, the promise of personalize medicine and genetic testing is beginning to help us understand these cancers and their treatments even more. He talked about how cancer is really 200 different diseases to be understood and managed. He gave a great analogy about how CVD (cardio-vascular disease) evolved and talked about how all the individual risk factors became asymptomatic diseases which have led to all the “know your number” campaigns around lipids and blood pressure. We talked about cancer as a process which led us into the discussion about palliative care and shared decision making. He made another good analogy here about driving a car. We need to understand the value of wearing our seat belt and having insurance, but we have to make the final decision about whether to do that or not. We talked about personalized medicine including genomics and epigenetics. We talked about how this impacts dosing and understanding of the tumor. (Interesting in a conversation with another person in this field this week they were telling me about how tumors and viruses change over time and those implications on genetic test results.) We also talked about SNPs and the complications in getting validation in studies due to sample sizes. We wrapped up this topic with discussions on coordinated registries and work that companies like 23andMe are doing. Our final topic of discussion was around clinical practice algorithms and how evidence-based medicine (EBM) gets implemented. We talked about the use of guidelines and how those allow for monitoring the use of EBM standards. We also talked about the need for integrated EMRs that would allow for benchmarking and linking outcomes to use of guidelines. This is a fascinating area. Cancer affects most of us either directly or through some family member or friend. What’s Next For The PBM Industry? And, there will certainly be more (e.g., the rumor about Cigna’s pharmacy business). I also think that we’ve seen Walgreens become a lot closer to the independent pharmacies and would expect more changes from them. Mail order has certainly been a driver, but as I’ve discussed and Adam Fein has discussed, this is a challenge to grow these days due to pricing, generics, and 90-day retail. There’s been lots of generics coming to market, but many others have written about the patent cliff and it’s potential impact. There’s been plenty of discussion about generic spread and some of the transparency efforts have impacted this. 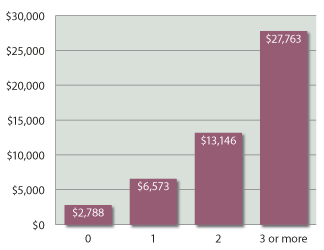 While many still think rebates are a profit driver, my perception is that most of that is already shared with clients. You would eliminate spread which has been tried by numerous companies under the “transparency” framework. You would eliminate rebates and move to an outcomes-based contracting approach. You would create a competitive market for mail order which is 90-day retail. I might even look at how the Prime Therapeutics ownership model could be applied at a broader level to unions, employers, and small payers. A big focus on specialty with oral solids being basically just coordinated for DUR purposes around claims processing. A shift over the next decade to be very genomics oriented. A shift in customer service from general call center to a broader self-service option. Much greater involvement in condition management possibly even with a shift to work with the providers. A role in coordinating Rx, Dx, and lab data to drive outcomes. 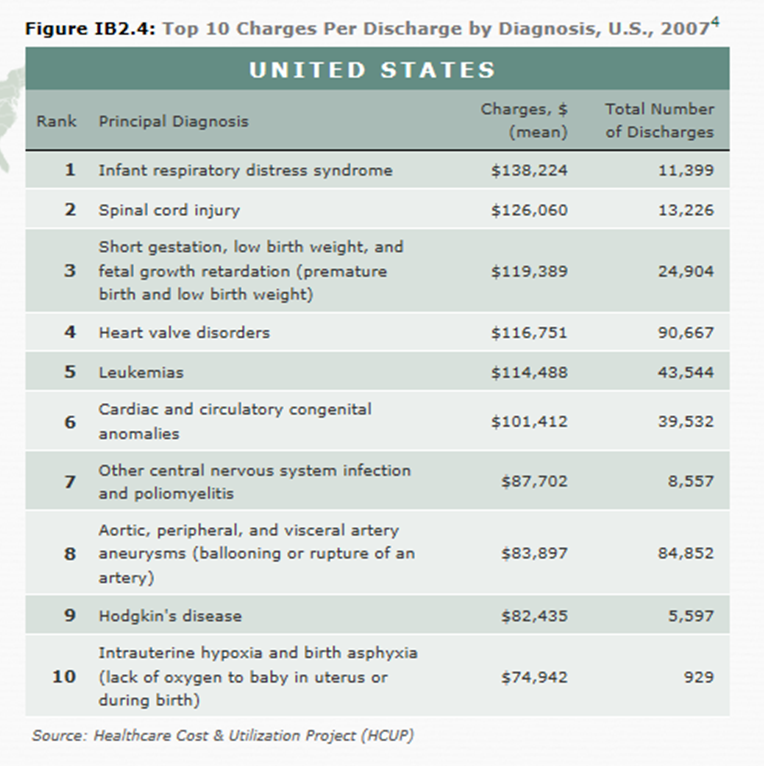 Being known more for clinical care then cost management. I personally also think you’ll see the pendulum swing back to a closer relationship between the PBMs and pharma which I think is important as you focus on more and more orphan drugs and specialty conditions with genomics and high costs. I think the key question is whether one of the traditional PBMs evolve and own this space or whether a new challenger comes in and shakes up the industry. Traditionally, the industry has been basically driven by consolidation with limited success by new entrants. 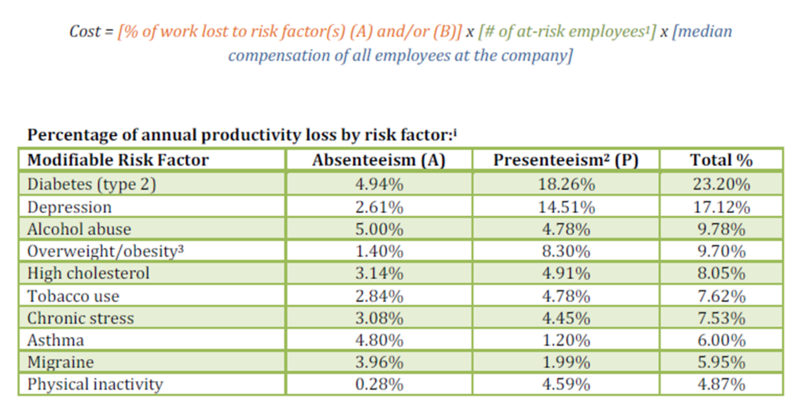 While absenteeism costs are obvious as in sick days paid out, presenteeism is harder to estimate but can have significant costs. Presenteeism occurs when people come to work sick and are not productive. I’m sure there are numerous methodologies out there, but I found this one that seemed simple and gave me some data by condition on both factors. The first thing we discussed was the concept of ACOs (Accountable Care Organizations) and how employers think about them (or similar concepts). She talked about the fact that most employers don’t understand the ACO framework in specific. They may have heard something about the idea of a medical home or mention of the ACO, but they are more broadly focused on the conversion to an outcomes-based future. Initially, there are some leading edge employers and coalitions that you hear talking about these concepts at conferences, but in general, employers are going to look to their payors to lead this effort and think about how to embrace these new quality and payment frameworks. Reform – What is the future of healthcare reform and how will that impact employers? Cost – How can we control costs both direct and indirect? And, what is the role of prevention in cost management? Engagement – Even if we understand how to control costs, how do we engage consumers to take action? Is it through incentives, gamification, social media, mobile, or other tools? Phase I: Payment for completing and HRA (which many companies have done for several years). We wrapped up with two topics – new technologies and ROI. In today’s environment, everyone is looking at mobile health and telemedicine. The question of course is how to get these tools used, paid for, and demonstrating the ROI. From a technology perspective, we talked mostly about the idea of the “digitally naive” (i.e., people under 16 today) for which technology is the norm. They’ve never experienced life without mobile phones and computers and Google. As this generation becomes patients, they won’t think twice about using technology as a way to see their physician and monitor their health. I had the opportunity to listen to some heads of HR a few weeks ago and then sit in on an employer session yesterday at the World Healthcare Congress here in DC. It was interesting the common themes that clearly were emerging from the presentations by PEBTF and CalPERs along with the event I was at before. Here’s a great infographic on costs. 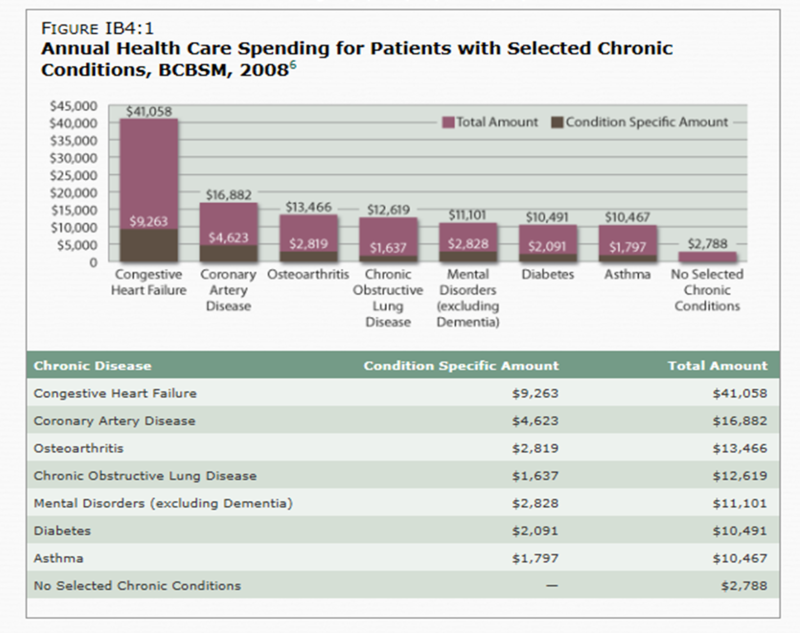 This is another reason why you need a company monitoring your claims for cost savings opportunities and working with patients and physicians to implement evidence-based medicine and route patients to centers of excellence (better outcomes for lower costs). My job is safe, and for some… I have to move to St. Louis. The people in the grey area that are uncertain are the people that are probably the most anxious. And, of course, some of this is happening to the Express Scripts’ people also where there are overlapping jobs. Since I’ve been out looking to move for my new job, I have some idea of the basic types of questions that those employees looking to move have, and I haven’t found the information that easy to get. Pharmacies: Generally, the majority of pharmacies in town are Walgreens, but you won’t have access to them. CVS is building a presence here, but you’ll likely go to the grocery store, big box, or independents. Grocery Stores: The town is dominated by two local chains called Schnucks and Dierbergs. There is a Whole Foods and a Trader Joes. There are a few Shop and Saves. Workout: There are lots of chain and small gyms around town. If you haven’t been to one, you should look at the Lifetime Fitness in West County. Places: You’ll hear people talk about “the Hill” which is an Italian area in the city. You’ll hear about Clayton which is the one business area outside downtown. You’ll hear about West County, South County, and North County which are just like the names (counties around St. Louis city). You’ll hear about 40, 70, 44, 270, and 170 which are the highways. You’ll hear about Forest Park (which is our version of Central Park). Vacation: The two Missouri vacation places you’ll hear people talk about are Branson and Lake of the Ozarks. Casinos: There are several casinos around town. Smoking: Smoking in restaurants was banned a few years ago. Other Big Companies: A lot of the big companies like Anheuser-Busch and Ralston have been bought, but they still have a big presence here. Emerson Electric is here. SSM Healthcare is here. Ascension Health is headquartered here. Centene is here. Enterprise Rent-A-Car is headquartered here. EdwardJones, AG Edwards, and Scottrade are all here. Citibank has a large presence here as does Mastercard. Build-A-Bear was started here. Colleges: Washington University (WashU) and St. Louis University (SLU) are both here in town. Areas to Live: I would say that many people from Express Scripts management live in West County (Chesterfield, Wildwood, Ellisville) which is where I’ve lived most of my time here. There are lots of transplants out here. Traditionally, most people from St. Louis will live east of 270 in Clayton, Ladue, Frontenac, Webster, Kirkwood, or in the city (see Delmar Loop area or Washington St. downtown). Some other areas where people will live include St. Charles or some people in Illinois. If you like a new house with lots of square footage, you can get that in West County or other areas farther. There are even a few new subdivisions being built by Pulte homes. Golf: If you like to golf, there are lots of places to go. I really like Tapawingo and Peveley Farms. There are also many good clubs which can be joined for a reasonable fee like St. Albans or Forest Hills. Schools: The public schools are very good (at least from what I know out here in the Wildwood/Chesterfield area). There are also a lot of private schools with a huge emphasis on Catholic schools. Things for Kids to Do: There are lots of great places like Purina Farms, Six Flags, Dave & Busters, City Museum, The Magic House, Grants Farm, and of course…the Arch. Additionally, there’s the zoo and the Science Center. If you go south in Missouri, you’ll see armadillos. There is wine made in Missouri (although I can’t vouch for quality). You can do a bike tour stopping at multiple wineries which is fun (and maybe dangerous). Here we fry our ravioli to make toasted ravioli. You can also get lots of gooey butter cakes and cookies. Another big food favorite here is pork steaks (which are actually quite good). Eating Chocolate = Lower BMI! Eating chocolate five or more times a week on a regular basis can translate to a one point drop in BMI on average, compared with those that don’t eat it. 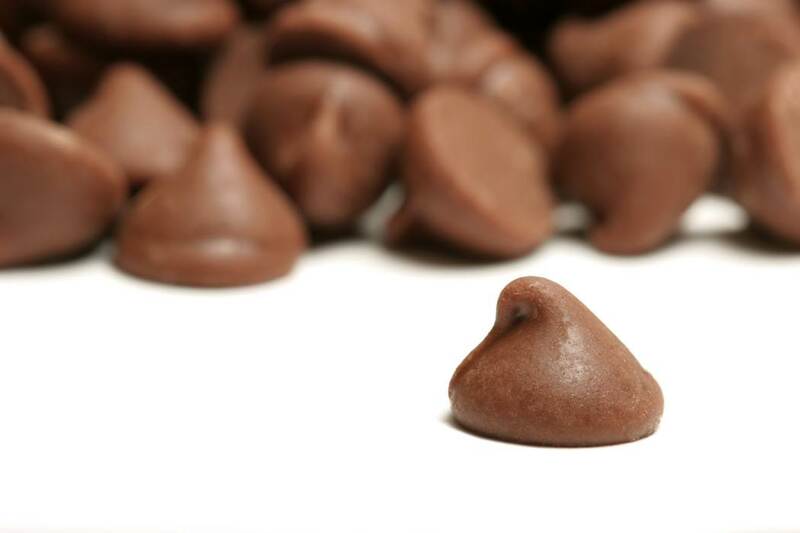 It sounds too good to be true, but apparently chocolate can help the body absorb fewer calories from fat. Traditionally, consumer marketing has focused on the “young invincibles” as they are sometimes referred to in healthcare. Those are the 18-34 year olds that traditionally were the DINKs (dual income no kids) and younger population with more disposable income or focused on acquiring goods (as they bought homes and started careers). If [young adults] have no money in their pockets, there is nothing to sell them. I often talk about the issue of communications in healthcare. That could be patient to patient, healthplan to patient, pharmacist to patient, or physician to patient (or many more). Understanding health literacy and personal motivation are critical as are so many other factors. With that in mind, I was glad to see this new campaign from AHRQ. “When patients become more actively involved in their own health, there’s a much stronger likelihood their health outcomes will be better. That’s why “Questions are the Answer,” a new public education initiative from the U.S. Agency for Healthcare Research and Quality (AHRQ), encourages patients to have more effective two-way communication with their doctors and other clinicians. · A 7-minute video featuring real-life patients and clinicians who give firsthand accounts on the importance of asking questions and sharing information – this tool is ideal for a patient waiting room area and can be set to run on a continuous loop. · A brochure, titled “Be More Involved in Your Health Care: Tips for Patients,” that offers helpful suggestions to follow before, during and after a medical visit. · Notepads to help patients prioritize the top three questions they wish to ask during their medical appointment. Do physicians have time for this and are they prepared for these dialogues in plain language and with handouts and URLs they recommend? Are patient’s prepared to slow their physicians down and make sure they explain everything? Will this get measured at some point as a qualitative metric and correlated to outcomes?